Giedre Steikunaite goes to watch Palestinians cross into Israel every day. Men say Good morning (‘Sabah al-kheyr,’ in Arabic) quietly and politely. They carry small plastic bags with their lunch. They are going to work. Most of them do building work. They start at seven or eight o’clock in the morning. It’s 2.30 am. ‘Where in the world do you see people leave for work in the middle of the night?’ asks a middle-aged man. He doesn’t want an answer. ‘This is the most racist state in the world,’ he says and hurries off. He needs to hurry because there is a queue. But there is no way to ‘move’. Hundreds of people are between the metal fences with razor wire and on CCTV. The metal fences control them. This is Eyal. It is an Israeli checkpoint outside Qalqiliya, a Palestinian city with Israel’s Wall around it. Eyal was built in 2007. 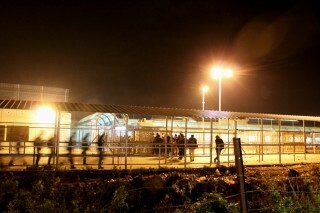 Eyal is one of 11 Israeli military checkpoints where they control people going into Israel. The staff in Eyal are from private security companies and not the Israeli army. The private security companies earn between $50-100 million. Solly and Gila Olishar own a private security company, Mikud Security. They work for the Israeli government. Eyal opens at 4 am. About 4,500 Palestinians with work permits cross it every night, and they arrive there two hours before. They go through a turnstile and a metal detector scans them. There are only two metal detectors working so it is very slow. Then staff check their documents and their fingerprints. Sometimes the staff strip-search them. They leave the building on the other side and wait for buses to bring them to work. There are a number of food stalls where they can get an early breakfast. They are more friendly than the military checkpoint.They sell fresh bread with cheese, sesame seeds, and spinach, soft drinks, hummus, baba ganoush, bars of chocolate, packets of crisps, and lighters and cigarettes. All this is ready for business at 1 am. They are brightly lit and have posters in Arabic. The posters ask workers to be safe at work - ‘Wear a helmet’. The food stalls serve the thousands of Palestinians who come from the Palestine area of the northern West Bank. They are from Jenin, Nablus, Qalqiliya, and other villages nearby. The night is calm. On Sundays, the start of the working week in Israel, it’s more crowded and noisier, the workers say. Sometimes it is too much. In December 2014, thousands of workers had a strike in nearby Sha’ar Ephraim, an Israeli checkpoint that separates the Palestinian city of Tulkarem from At-Tayba on the ‘other’ side of the Green Line (1949 Armistice Line). They protested against overcrowding and asked for better treatment. They lost a day’s money but won the battle. Things were better and the queues were shorter. The Israelis paid to open all 16 of the checking booths and not only four or five. But things were better only for a few days. Then things went back to ‘normal’. 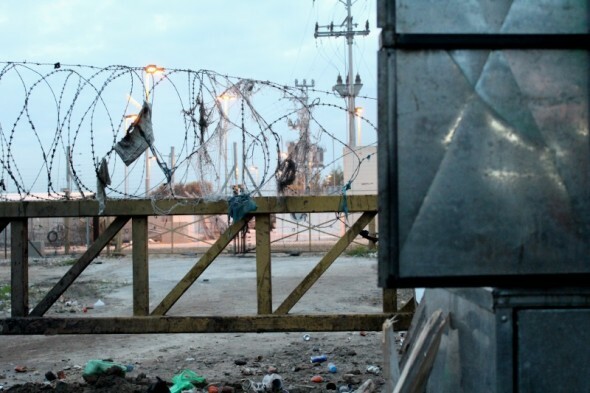 In January 2015 59-year-old Adel Muhammad Yakoub was killed at that same checkpoint. He was killed in the crowds. They were too big. He leaves a wife and seven children, aged between 11 and 16. The local newspapers wrote about all of this. But the suffering of thousands of Palestinian workers is not news. It is part of everyday life. And the problem is not the conditions at the checkpoint. It is the fact that there is a checkpoint. ‘I’ve worked in Israel for 25 years and it was easy to get to work,’ says one man. ’Why is life like this?’ he asks calmly and angrily. It’s hard to make the workers here smile. There is nothing to smile about in this place where workers are not treated like humans. And working for the Israelis for very little money is another psychological problem. The workers must work for 16 hours a day in the West Bank for very poor wages to feed their families and have a life. It’s a terrible situation. This is the legal way to feed your family. The other way is jumping over the Wall and running through a hole in the fence. There is the danger of being shot or caught inside Israel without the right papers. But thousands take the risk. ‘People have died here, too,’ says a cigarette seller. People in the queue are so close together they cannot move. They are tired and angry. They start fighting people who try to push into the queue. Only one person at a time can go through the turnstiles. ‘One by one, move one by one,’ shouts the bored loudspeaker voice. One by one, 4,500 people, every night of the week, every week of the year. But not on Saturday, the Jewish Sabbath, when workers get a day off. Their Muslim holiday is Friday, when they have to work. A man who runs a café is the father of two children, aged one and four years old. I asked how his business is going. He shook his head. ‘I make around 100 shekels [$25] a night, and spend half of it to buy food,’ he says. He doesn’t have a second day job because there are no jobs. Unemployment in the West Bank is around 20 per cent. But the people who work often cannot feed their families because of low wages and the rising living costs. The main reason for crossing into Israel is to find work. Wages there are two or three times higher, but lower than those of Israelis. The call to prayer from mosques in Qalqiliya comes at 5.14 am and stops the metal gate. Many Palestinians kneel down to pray on the side, while hundreds of others address God while standing between metal fences. There are thousands behind them and they cannot risk losing their place in the queue. At 6.30 am, a 38-year-old man from Al-Fara’a refugee camp near Tubas (northern West Bank), has half an hour to wait. On his work permit it says that he can only cross at 7 am. ‘If their clocks say it’s 6.58, they will turn me back and I have to queue again,’ he says. This afternoon he will go home. Tomorrow he will be here again. It is a trip of several hours from Al-Fara’a to Qalqiliya via Jenin. Only a few Palestinians receive the ‘sleeping permits’ that allow them to stay in Israel overnight. Then they don’t need to go the long way back home every night. The workers who stay overnight often sleep in the buildings they are helping to build in the day. Rent is expensive and Palestinians from the West Bank cannot rent rooms. It’s 7 am, and most of the people with work permits have crossed. They will return the same way. They are not allowed to use a different checkpoint on the way back. They return in the afternoon, go home, have dinner, say hello to their children, and go to sleep. They are here again the next night at 3 am. During the day Palestinians come to Eyal to apply for prison visit permits or medical treatment permits, or because they must come for interrogation. In the last few weeks, the Israeli army ordered many Palestinian men from the Qalqiliya district to come for interrogation. They ask them questions about their opinions and activities. The local people say this is because of the new military commander. There is a room to the right of the workers’ entrance where they hold these young men. Food stalls start to close as the sun rises. There is a lot of rubbish. From the roundabout just outside Qalqiliya city, a road leads to another Israeli military checkpoint. Cars with yellow (Israeli) licence plates pass through quickly. They are carrying illegal Israelis living near Qalqiliya. They’ve just woken up and they are on their way to work in Israel. NOW READ THE ORIGINAL:http://newint.org/features/web-exclusive/2015/02/03/israel-palestine-checkpoint/ (This article has been simplified so the words, text structure and quotes may have been changed). This page was last edited on 8 February 2015, at 17:51.